At New Jersey center for students with disabilities, many get one-on-one aides in emergency drills. 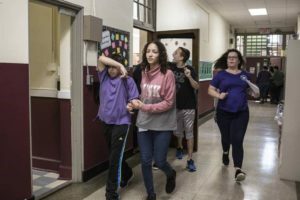 As schools beef up security in an age of fear of campus shootings, a New Jersey center for the extremely disabled goes to extra lengths to practice for the unthinkable. 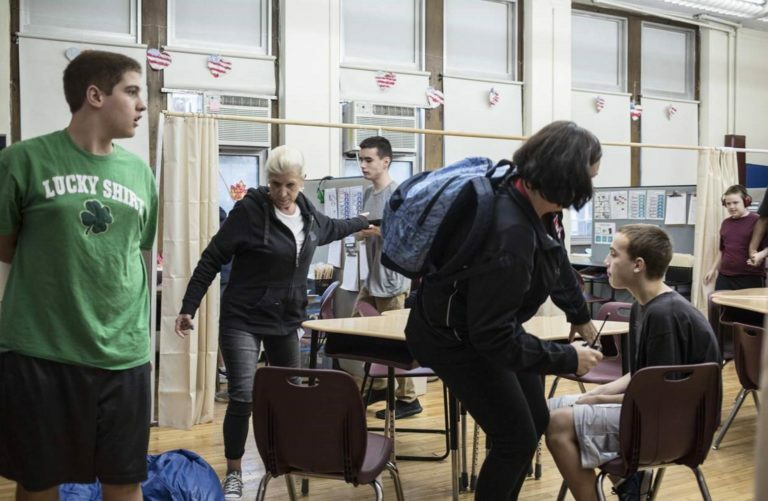 At The Phoenix Center in Nutley, just west of New York City, many students are terrified by loud alarms for security drills, changes in their routine or even something as simple as using a different doorway than usual. Many of its 143 students, ages 6 to 21 years old, have autism, Down syndrome, severe behavioral challenges and other problems. The school has an emergency plan on paper for each of its students. Some have visual impairments, seizure disorders or a mix of medical complications. One morning this month, in one of the first drills of the new school year, the principal announced an evacuation over the public address system. Students streamed out of classrooms toward the main exits. Most had one-on-one aides. As often happens, one 18-year-old stopped on the front steps leading outside and wouldn’t budge. Several male staffers had to scoop their arms under his armpits and help him walk to an evacuation site nearby. A 15-year-old girl began to cry and pummel herself in the back of the neck. Her aide calmed her down by rubbing her head. Despite such flare-ups, the center took less than seven minutes to clear out and take attendance. Like all schools in New Jersey, the center must have one fire drill and one security drill monthly, including lockdowns and evacuations. Teachers carry ‘‘social stories” for some students, with pictures and symbols for those who can’t read. A visual aid for a fire drill, for example, has a cartoon showing orange flames and a bell ringing. Then it shows a boy covering his ears, and students lining up at a door to go outside. Another for a lockdown shows a photo of a teacher’s hand putting a key in a door, turning off a light switch and putting a finger to her lips to signal silence. The school’s leaders had been considering security enhancements for a while, but a gunman’s deadly shooting rampage in Parkland, Fla., which left 17 people dead in February, spurred concrete steps. The school has an emergency plan on paper for each of its students, whose northern New Jersey districts pay annual tuition of $65,000. Some have visual impairments, seizure disorders or a mix of medical complications. Each emergency plan lists a host of details, including the name of the student’s aide and a backup, medications, need for devices like a helmet, oxygen tank or wheelchair, and any favorite soothing items, such as blankets or fidget spinners.